Sales of two-wheelers in Patna have skyrocketed over the past few years. Keeping in mind the number of vehicles on the roads in India, the Government of India introduced a rule under the Motor Vehicles Act, 1988, directing all vehicle owners to have at least a third-party insurance policy. There are a number of insurance providers in India that offer two-wheeler insurance policies in Patna. With a plethora of options available from different insurers, it can be hard choosing your ideal insurance provider. 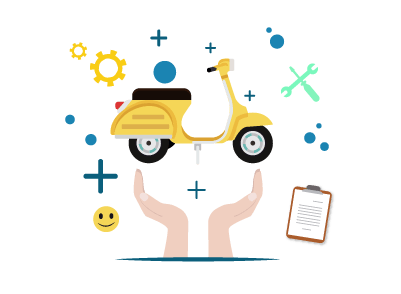 The best two-wheeler insurance policy in Patna is relative to your requirements, the coverage you want and the premium you are willing to pay. Some of the popular insurance companies in Patna that offer motor insurance for two-wheelers have been listed below. Contact the customer care service. A representative will be able to provide you with assistance in finding a cashless network garage. When you opt to use the services of a cashless garage, the most important benefit is that the paperwork is handled by the garage. Apart from this, the bill is settled directly by the insurer reducing the financial burden on you. There are a number of other benefits associated with cashless network garages. Out-of-pocket costs - When you choose cashless settlements, the insurance company settles the bill. You will not be required to pay the money upfront and collect it later from your insurance provider. You only need to pay for what is not covered by your policy. Branch Visits are not Required - With reimbursement claims, the customer is required to visit the branch or meet the agent, submit documents and collect a reimbursement. With cashless claims, the customer can contact the insurance company through the customer care. Once the claim is approved, the garage and the insurer will handle the rest between themselves. Fast approvals and settlement - Getting approvals on cashless claims are usually done within 24 to 48 hours. When the bike is ready, the settlement of the bill is handled between the insurance provider and the garage. The customer is not required to collect and submit documentation and wait for a reimbursement. Cashless Settlements - Cashless settlements have a number of benefits in comparison to reimbursement claims. If your insurance provider offers cashless settlements, you will not be required to pay from your own pocket for the repairs. Cashless claims settlements save a lot of time, reduce the hassle and own expenses.